Over the years, we've driven by the mining town of Randsburg off of Hwy. 395 a number of times while en route to the Eastern Sierras. But the only time we actually made the turnoff to Randsburg was in March of 1998, on our way back from Red Rock Canyon on Hwy. 14, when we decided to detour and do a scenic drive-through. I don't have much to say about this trip since we didn't really get out of the car to actually take in the town, but I think it totally warrants a revisit. Gold was discovered in the Rand Mine (named after a gold mining region in S. Africa) in 1895, and to date, there's still a remnant population of around 70+ folks living out here. 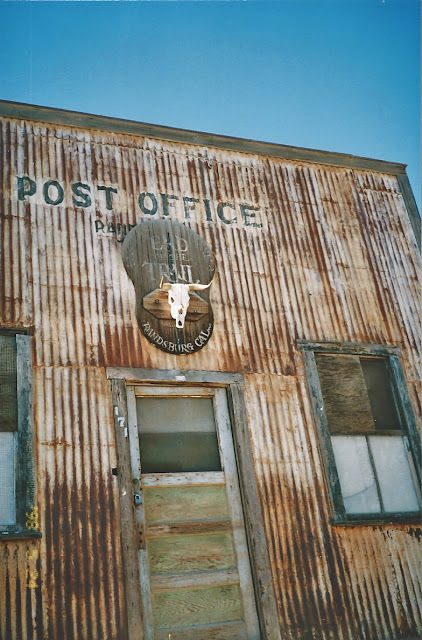 3/24/98 Randsburg post office. I don't know if this is the original, but according to Wiki, the first post office here opened in 1896. Location: 17 miles south of Ridgecrest (between Kramer Junction and Ridgecrest) in the Rand Mountains.